Lately I have been rattling around in my back yard. I have been rattling around there so much that I have an area I have taken to calling The Farm. At least that is what The Internet has started. About a year or so ago, I got the bright idea to start propagating plants. I have an irrigation chain on the lawn that is perfect for this. Each sprinkler head puts out a gallon of water or less an hour. Think of it as what you would do with a watering can. On a farm, this would be considered Drip Feed Irrigation. There are about 10 pots on that chain, plus the orchids. It saves me from pretending that I have it in me at dawn to be out there with a hose every day. I may be up at 5AM, but I am not that crazy. Mind you, plants in pots don't have a long lifespan. Sometimes the pots just "up and die". Other times, they're helped by critters. Snakes don't bother them, but Iguanas, Opossums, and domestic animals may. Like my Damn Neighbor's Damn Cat. Not only have I caught it on my Jeep and inside it, I have caught it inside the pots. Never mind that blasted cat, I had pots to fill. I went through a number of iterations of Mexican Petunia, or Ruellia. I planted so many that I had to stop. It filled in the border next to the fence on the East side of the property nicely and I have deep green leaves and purple flowers every day. I then stopped and thought, what would help? My hedge on the West side was dying. It needed things to fill in the gaps. At that point, I had about four pots to start, so I filled one with Podocarpus. Japanese Yew. I'd snip off about a six inch portion, dip it in rooting hormone, and stick it in the pot. While they grow slowly under that condition, they did grow. I was surprised to find that I got about 3/4 of them rooting. I would lose another quarter when they got transplanted, and another quarter after that. Apparently they didn't like the area that the hedge was in either. Then, months later, I got The Bright Idea. Why not just stick them in the ground at the hedge? Why bother with the pot? That drip feed irrigation line is under the hedge as well, but is mainly turned off. Lets try. Remember that I call this The Farm - I planted 100 Podocarpus cuttings under the existing hedge. Densely packed. I did it over three days. The third day of Cut/Dip/Stick, I noticed something. 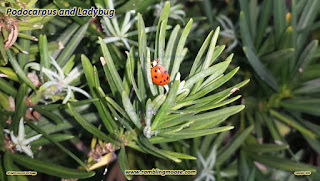 The Podocarpus had visitors. There was a bit of a white dusting of mites over the newer pieces, exactly what I needed to plant. But feeding on the white dusting were dozens, or perhaps hundreds, of Ladybugs. My hedge was covered with hundreds of miniature Volkswagen Beetle looking creatures all happily gorging themselves on much less beneficial mites. So I merely cut around the Ladybugs. They would get disturbed and flutter off, sometimes landing back on the plant, other times on me. No problem there. I knew how helpful they can be, since they love to dine on Aphids, and if you ever tried to grow ornamental Hibiscus, you know that you will eventually end up with Aphids. As for my Hedge? Well I'm about a month into the whole Farm thing. I'm finding that about 3/4 of the hundred cuttings look like they're still alive. I'll leave them be. Since the Ladybugs cleaned off the parent plants, I have healthy Podocarpus in the yard. I will give the Ladybugs the credit for that. I always thought that Podocarpus were about as close to "Carefree Plants" as I could get in South Florida's bizarre conditions, and I suspect that as long as they're found by the beneficial insects, I'm right. Since the area that I am planting created an empty zone, I'm having a bit of a victory. More accurately, a Victory Garden. You see, one of those Internet memes was if you cut the tops off your carrots, you can stick them in the ground and get more carrots. They're growing out there too, right in front of the Podocarpus and the dying Jasmine Hedge. Just keep the critters away.